Australian drivers have secured a trio of top ten results at the 2015 Rotax MAX Challenge Grand Finals in Portugal. Former Australian Champion Jason Hryniuk finished as the highest placed of the 13-strong contingent of drivers from Down Under with a ninth placed finish in the DD2 Masters class. Having previously competed in Europe on several occasions during last two decades, Hryniuk used all of his experience to record a strong finish at the event that saw 288 drivers assemble at the Portimão circuit. “After qualifying eighth before getting a 20 place penalty it was going to be hard getting back up to the front, so to finish with ninth placing is a great result,” said Hryniuk. “The quality of drivers in the DD2 field was very high with several ex Formula Super A and Formula A drivers on the grid. “This result was a real team effort and I’d like to really thank Troy and Lorraine Farley, Darren King and Brett Rowley from the CRG team and also to everyone at International Karting Distributors for making this event possible. Finishing one place behind Hryniuk was fellow Australian Adam Hunter while Queenslander Scott Howard was unable to progress through the second-chance race. 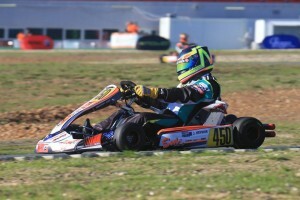 Victorian Reece Sidebottom was the best of the Australian junior drivers with a tenth place finished. Aaron Cameron was holding down third in the pre-final only to be spun by a fellow competitor dropping him to the back of the 34-kart field. Cameron and his fellow Australian Zane Morse both failed to finish the final. In the Senior Max class Brad Jenner finished as the best placed Australian in 17th place. After running near the front of the field for the majority of the week Pierce Lehane was forced onto the sidelines in both the pre-final and final while Cody Gillis’ and Nicholas Andrews’event ended in the second-chance race. After making the finals stage through the second-chance race Troy Woolston finished 19th in the DD2 final that saw Rubens Barrichello cross the line in fourth place in the final after starting the race 20th. Jason Pringle had a challenging finals stage to finish 24th and Ryan Kennedy’s event finished in the second chance race. Victories at the event went to Frenchman Florian Venturi (Junior Max), Italian Alex Alex (Senior Max), New Zealander Ryan Urban (DD2 Masters) and Hungarian Ferenc Kancasr (DD2).